The central courtyard is a green public plaza designed with maximum variation in materiality, plantings and topography to enhance the recreational and aesthetic amenities and qualities of the space. 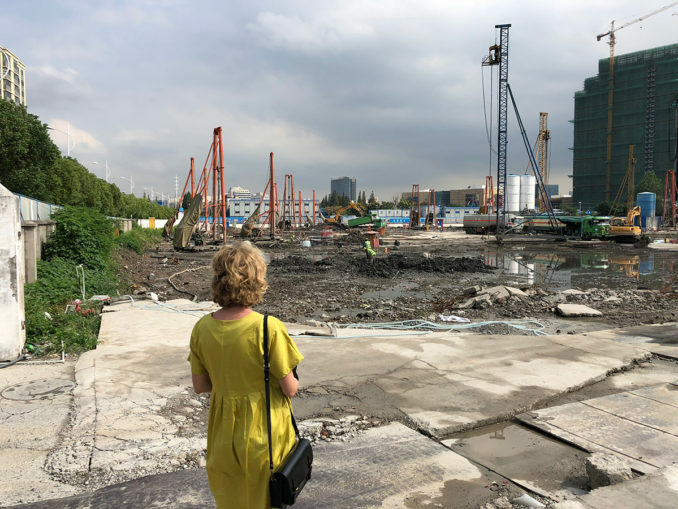 Together with Henning Larsen and client Tishmann Speyer, Danish landscape architects SLA have designed a unique urban nature oasis in the center of Shanghai called The Springs. 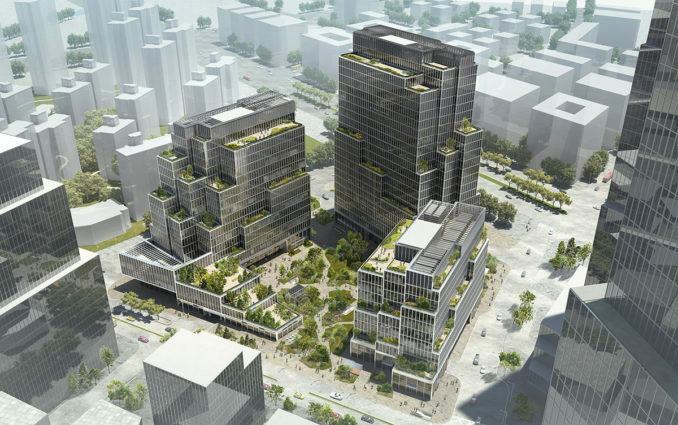 The project is a major commercial development in Shanghai’s Yangpu district – one of the fastest growing neighborhoods and education hubs in China – and aims to provide new, public amenities to downtown Shanghai. SLA’s strategy aims to optimize the space with regards to wind, light, noise and pollution while adding a clear program and identity to the site. 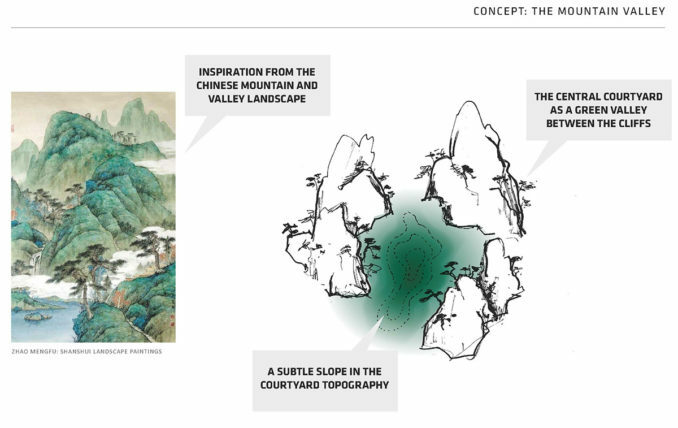 The Springs evokes the dramatic mountain landscapes found throughout rural China, mirroring the mountain landscape with tall, terraced towers sheltering a green public square. 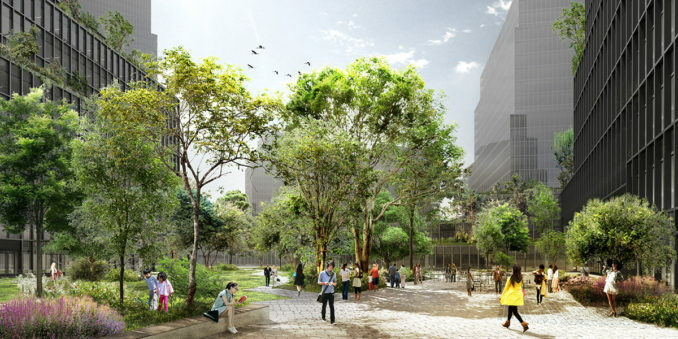 The massing of the buildings creates a sheltered microclimate within this plaza, with building positioning and vegetation working to improve air quality, reduce noise pollution and bring natural light into the space. The courtyard is open for all and act as the area’s vibrant city lobby. Thus, the nature of The Springs isn’t just a decoration – it’s performative. 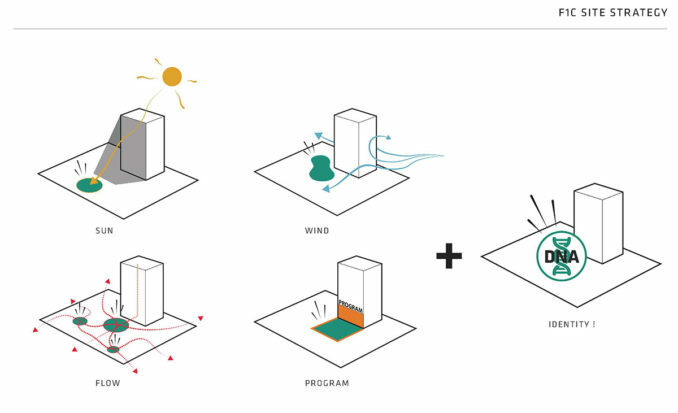 It will clean the air and is located and selected specifically with the building mases to block the cold, polluted winter winds from the north while opening up for the cleaner, cooling sea breeze from the south, creating new opportunities for public life and recreation. Besides solving the site’s micro climatic and air quality challenges, the new city nature is thereby used as a business case to create a public attraction and a healthy inviting outdoor atmosphere for both workers and citizens. The Springs evokes the traditional Chinese landscape painting, shan shui, with the terraces and balconies of the stepped buildings hosting lush gardens saturated with native vegetation. “In SLA, we always aim to use nature to solve pressing urban challenges while at the same time adding tangible life quality for all users and visitors of the site. For this unique Shanghai project, it’s been a privilege to collaborate with Tishman Speyer and Henning Larsen and feel the shared understand regarding the value of nature. It’s also amazing how Shanghai’s city planning has demanded maximum green coverage,” says Rasmus Astrup, partner in SLA. 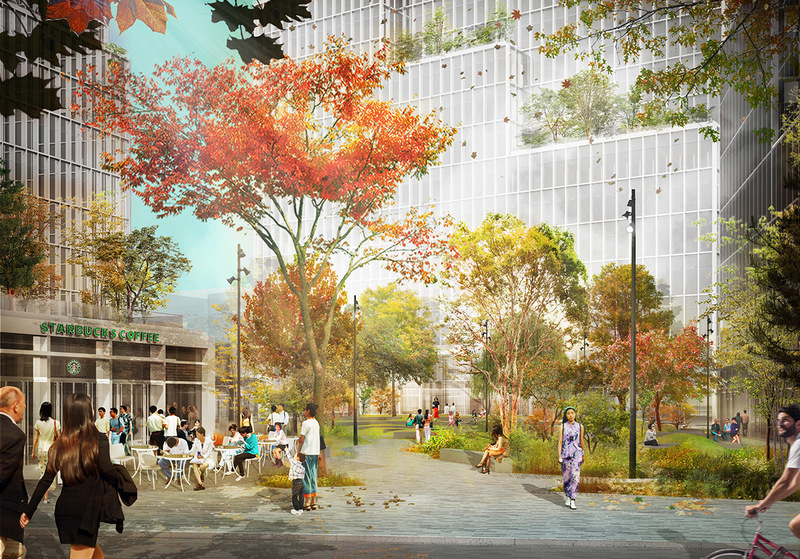 The plaza will become the public heart of the new development with many recreational opportunities. SLA’s project brings natural and lush plantings into a highly commercial office area. Inspired by shan shui, a traditional form of Chinese landscape painting, the terraces and balconies of the stepped buildings host lush gardens saturated with native vegetation. Thus, the new project draws on deep roots in Chinese art and landscape architecture. SLA’s landscape design is inspired by the dramatic mountain landscapes found throughout rural China, mirroring the mountain landscape with tall, terraced towers sheltering a green public square. 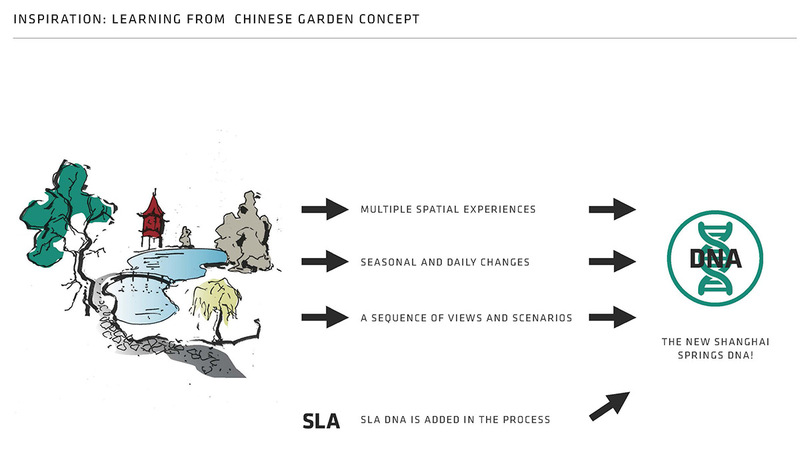 The project merges traditional Chinese garden philosophy with the newest scientific knowledge regarding the functional use of plants and nature. Variation in materiality, plantings and topography maximizes the functional, recreational and aesthetic amenities and qualities of the space. “One of the most impressive things about traditional Chinese gardens are the way they are able to create the feeling of a generous space on a very small site. The inspiration in The Springs comes from the way the flow and series of variated spaces is always optimized in the Chinese garden. It’s carefully planned to maximize the experience by control of all physical elements and the view through them. This project is very much about space and experience of different atmospheres within the same courtyard. 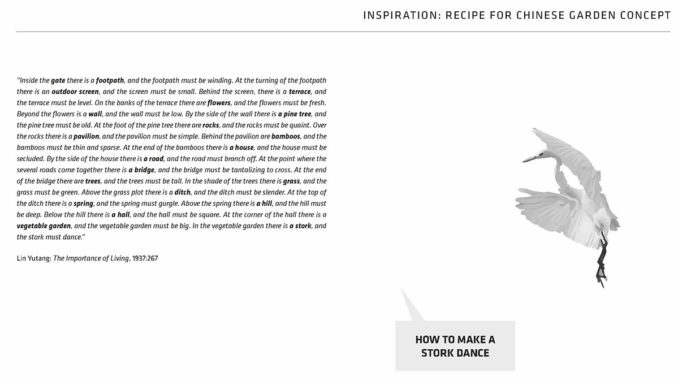 A subdivision of the landscape is created with variation in materiality, plantings and topography in order to achieve scenes linked in a sequence. And thus maximizing both the recreational and aesthetic amenities and qualities of the space”, says Rasmus Astrup. The Springs began construction on 12th July 2018 and is expected to finish in 2020. Project architect Laura Myllyluoma visiting the building site. 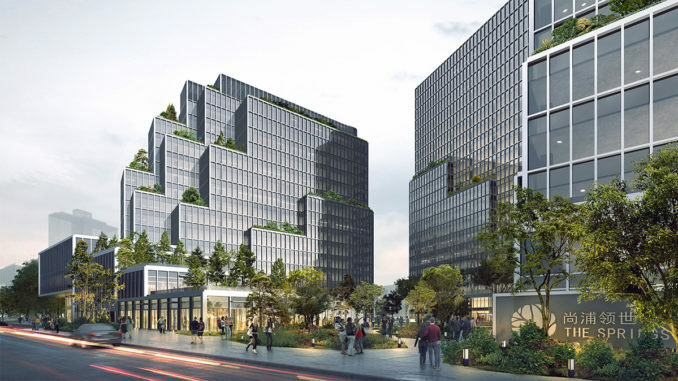 The project began construction on 12th July 2018 and is expected to finish in 2020. 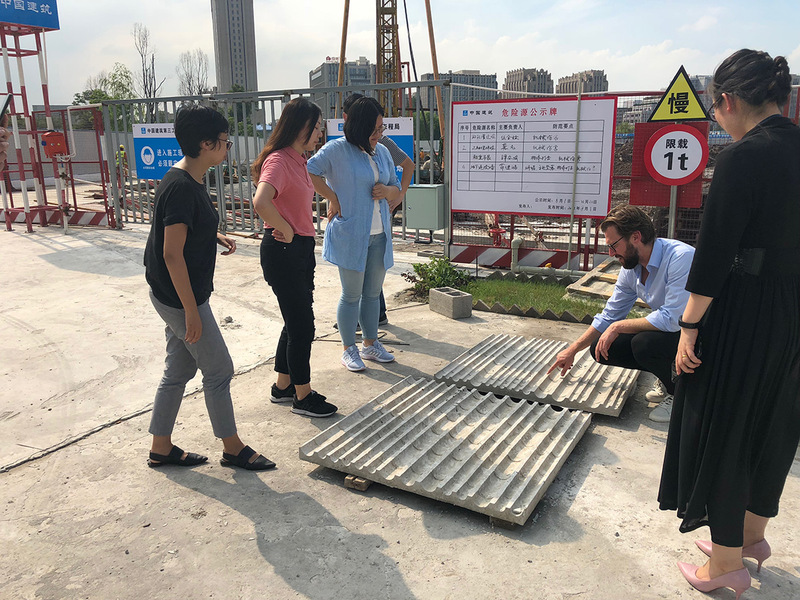 SLA partner Rasmus Astrup inspecting concrete casting forms which will provide all vertical surfaces of the public space with traditional bamboo shapes.